Join the discussion on our forums! Come discuss Rapid Fire over in our dedicated Rapid Fire discussion topic. Instead of the flavour being "Pew! Pew!" It definitely should have been "Ping! Ping!" Malygos Hunter. Coming soon to a wild near you. 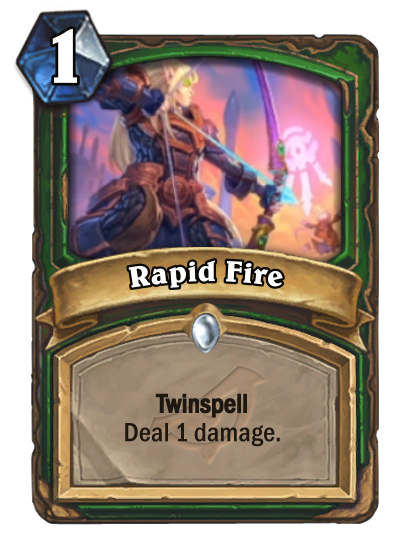 In between Vareesa, as well as Tuskarr Fishermen and Ancient Mages on more durable stealth minions, and, of course, not just Arcane Shot, but also this new gem, I think we may have Malygos OTK hunter without Malygos, on our hands. With Candleshot rotating out, I think this card might be a bit better than what most people think. Comparing it to moonfire doesn't really make sense, because the Druid's hero power allows them to clear a 1-health minion on turn 2 (or a 2-health potentially over 2 turns), where the Hunter's does not. What am I missing here? Feels like a worse moonfire. Edit: spacetime answered it for me. Its for removal with hunters mark, candleshot replacement. I get it now. Together with the weapon provided by Vereesa Windrunner, you can do 12 damage for 4 mana just with two copies of this. Adding Arcane Shot and Kill Command, there is some insane burst potential, and this card might have been the last puzzle piece. If I got her, I'll go full spell damage hunter in wild.